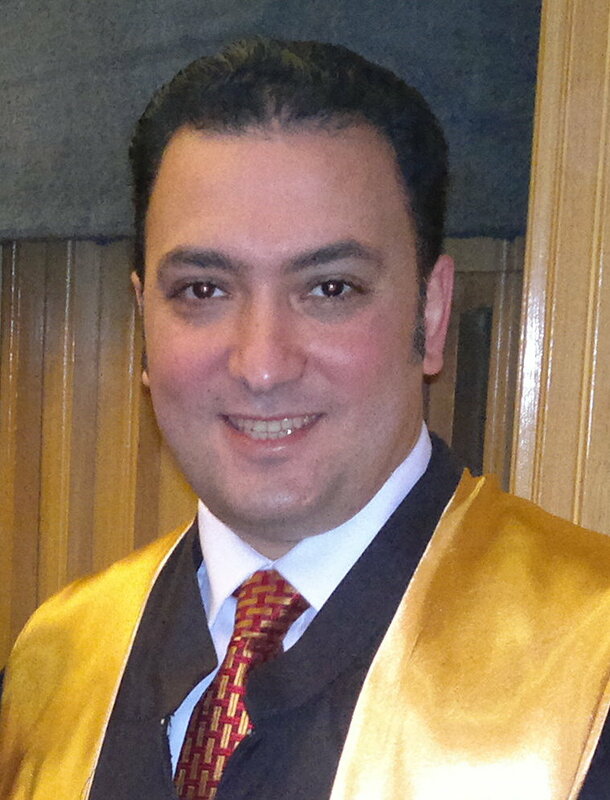 Hussein M. El-Attar , Ph.D.
Hussein M. ELAttar received the Bachelor’s degree from the Arab Academy for Science, Technology and Maritime Transport (AASTMT), Alexandria, Egypt, the M.Sc. and the Ph.D. degrees from Ain Shams University, in Electronics and Communications Engineering. He is currently an Associate Professor of Wireless Communications and Networks with the Electronics and Communications Engineering Department, College of Engineering and Technology, Arab Academy for Science, Technology, and Maritime Transport, Cairo, Egypt. He is the Quality assurance and Accreditation Coordinator for the department and Program coordinator of ABET accreditation. His current research interests include radio resource management, cognitive networks, optimization techniques, IoT, and 5G applications. He supervised many undergraduate projects, master thesis’s and Ph.D. dissertations in Arab Academy and other universities. He is a member of IEEE. Haitham Hassan, Hussein M. ElAttar, Asmaa Saffan, Hesham M. ElBadawy, "Optimal Operational Parameters for 5G Energy Harvesting Cognitive Wireless Sensor Networks" , IETE Technical Review, December 2017 (Impact Factor 1.33 JCR) , 2017. Ahmed F. Ashour, Hussein M. ElAttar, Mohamed A.Aboul Dahab, "Efficiency Improvement using Adaptive Hybrid Modulation/Coding/Frequency Selection Scheme for Future 5G Wireless Network" , 2017 17th IEEE International Conference on Communication Technology, (IEEE-ICCT 2017), Chengdu, China, 27-30 October 2017. , 2017. Hussein M. ELAttar, Mohamed Ibrahim El-Emary, "Energy, Delay and Hop Count Multi-Constraints QoS Routing Algorithm for Wireless Ad-Hoc Networks" , 2017 17th IEEE International Conference on Communication Technology, (IEEE-ICCT 2017), Chengdu, China, 27-30 October 2017. , 2017. Y.Alaa, Hussein M. ElAttar, F. Digham, Laila H. Afify, Hesham M. ElBadawy, "LTE Dynamic Scheduling Scheme for Massive M2M and H2H Communication" , The 8th IEEE Annual Ubiquitous Computing, Electronics & Mobile Communication Conference (IEEE-UEMCON 2017), pp 122-126, Columbia University, New York City, NY, USA,19-21 October 2017. (Best Paper Award). , 2017. Haitham Hassan, Hussien M. ElAttar, Asmaa Saffan, Hesham M. ElBadawy, "QoS Enhancements in Energy Harvesting Cognitive Radio Communications Networks" , The 6th IEEE International Conference on Communication, Networks and Satellite (COMNETSAT 2017), pp 110-114, Semarang, Indonesia, 5-7 October 2017, (Best Paper Award) , 2017. M. Youssef El-Ganiny, Hussein M. ElAttar, Mohamed A.Aboul Dahab, Talaat A.Elgarf, "Improved Coding Gain of Clipped OFDM Signal using Avalanche Effect of AES Block Cipher" , 2017 IEEE Pacific Rim Conference on Communications, Computers and Signal Processing (PacRim 2017 ), Victoria, B.C., Canada, 21-23 August 2017. , 2017. Heba Gharib, Hussein M. ElAttar, Hesham M. Elbadawy, "Enhancement of Multicast Scheduling Scheme over Wireless Cellular Networks" , Sixth International Conference on Future Generation Communication Technologies (FGCT 2017), pp 38-42, Dublin, Ireland, 21-23 August 2017. , 2017. Hossam M. Alsaket, Korany R. Mahmoud, Hussein M. ELAttar, Mohamed A. Aboul-Dahab, "Exploring Evolutionary Multi-Objective Techniques in Self-Organizing Networks" , IEEE Access, vol. 5, pp. 12049-12060, 2017. (Impact factor 3.244 JCR) , 2017. Hossam M. Alsaket, Korany R. Mahmoud, Hussein M. ElAttar, Mohamed A. Aboul-Dahab, "Resources Optimizer for Cognitive Network Using Multi-Objective Particle Swarm System" , The 26th Wireless and Optical Communications Conference (WOCC 2017) April 07-08, 2017, New Jersey, U.S.A. , 2017. Enhancement of Threshold Estimation in Energy Detection Models Deployed in Severe Fading Channels, "Mohamed Gamal, Hussein M. ElAttar, Asmaa Safan, Hesham M. ElBadawy" , 1st International Conference on Advanced Technology and Applied Sciences (ICATAS 2016). September 06-07, 2016. Kuala Lumpur, Malaysia. , 2016. Eman F. El-Gaml, Hussein ElAttar, Hesham M. El-Badawy, "Evaluation of Intrusion Prevention Technique in LTE Based Network" , International Journal of Scientific & Engineering Research, Volume 5, Issue 12, pp 1395-1400, December-2014 , 2014. Hussein ElAttar, Hussein Abdelaty, Salwa H. ElRamly, Mohamed A.Aboul-Dahab, "Enhancing the Performance of Wireless Adhoc Networks Using Spreading Codes" , Sixth International conference on. Computational Intelligence, Communication Systems and Networks, CICSyN 2014, pp 176-181, Tetovo, Republic of Macedonia, 27–29 May 2014. , 2014. Hussein ElAttar, Hussein Abdelaty, Salwa H. ElRamly, Mohamed A.Aboul-Dahab, "PHY-MAC Cross Layer Issues for QoS Provisioning in Wireless Ad Hoc Networks" , The Eighth International Conference on Information Technology: New Generations (ITNG’11),LAS VEGAS, NEVADA, USA. pp.100-105 , 2011. Hussein ElAttar, Hussein Abdelaty, Salwa H. ElRamly, Mohamed A.Aboul-Dahab. , "PHY-MAC Cross-Layer Optimized Design for Power Conservation in Wireless Ad Hoc Networks" , The Fourth IFIP International Conference on New Technologies, Mobility and Security (NTMS 2011), PARIS, FRANCE. , 2011. Hussein ElAttar, Hussein Abdelaty, Salwa H. ElRamly, Mohamed A.Aboul-Dahab, "Lifetime Maximization for Wireless Ad Hoc Networks Using Power Aware Routing" , Fourth UKSim European Modeling Symposium on Computer Modeling and Simulation (EMS’10), pp.455-459, PISA, ITALY. , 2010. S.H. Elramly, H. El-Attar, "Proposed Techniques to Increase Capacity of Mobile Communications Systems Without Increasing the EM Radiation Level" , Ain Shams International Conference on Environmental Engineering,Cairo, Egypt , 2005. S.H. Elramly, H. El-Attar, "Practical Field Measurements for Evaluating Radiation from Mobile Base Stations" , Ain Shams International Conference on Environmental Engineering,Cairo, Egypt , 2005. S.Elramly , Hussein El Attar, "GSM Base Station Antenna Model for Evaluating Human Exposure" , International Conference on Electrical, Electronics and Computer Engineer in. (ICEEC’04) , 2004.